This complete state law and regulation monitoring system saves you hours of research time. If your operations or interests cross state lines, you have to make sure your employment practices work in different jurisdictions. Problem is, state legislators nationwide are constantly working to amend existing laws or create entirely new ones. On top of that, deep within the bureaucracy of 50 state governments, agencies charged with implementing and enforcing those laws are developing new regulations. How can you possibly keep up, and keep your company in compliance? 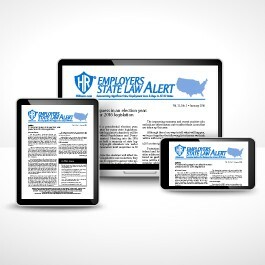 Start your risk-free subscription to Employers State Law Alert and stop worrying! 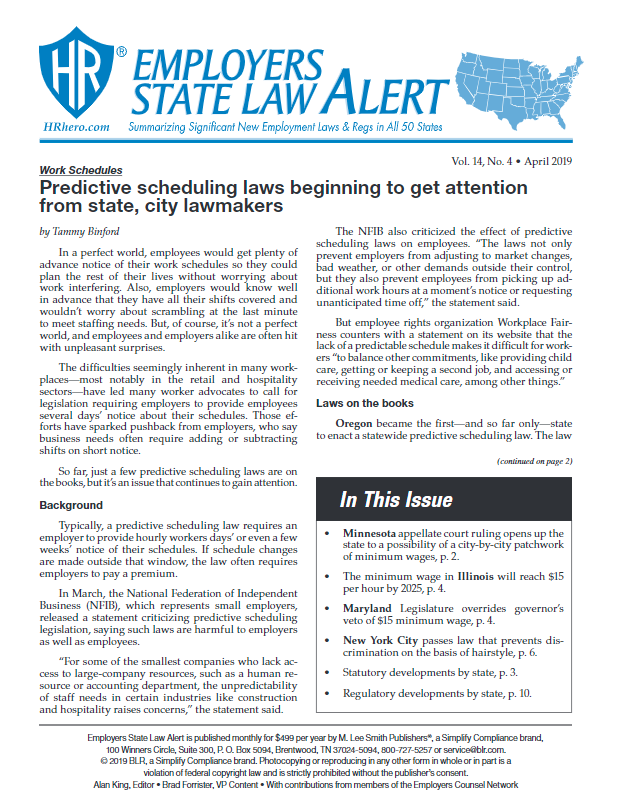 Each month, the Alert’s researchers uncover and summarize the latest state employment laws and regulations emerging from 50 state capitols. If a state in which you operate has just enacted new employment laws or changed existing ones. What you need to do to keep your policies and systems in line with new employer obligations. Exactly where to look for the complete text of a law or regulation -- this digital subscription links right to state government sites! 12 monthly digital newsletter issues, packed with summaries of state employment law and regulation changes. You immediately understand what’s happened, and whether you need to act. E-mail alerts when new state employment laws pass or regulations are enacted – only for those states you specify, to save your valuable time. Online access to ESLA Online, a database containing all summaries and links to the full text of laws and regulations. Call 800-274-6774 to request a free temporary Username and Password. The ECN is a nationwide affiliation of prestigious law firms, one in each state, representing management. Network attorneys have years of experience in defending employers against claims of harassment, discrimination, ADA and FMLA violations, wage & hour missteps, and much more. Already have your Username and Password? Click here to log in to ESLA online, where you can search for specific laws, select your states for e-mail alert purposes, and view back issues. Pricing for this product is for internal organizational use only for one user. For custom pricing, additional users/states or to discuss external or third party use, please contact customer service at 800-727-5257. GUARANTEE: Your 100% satisfaction is guaranteed. If for any reason you are not completely satisfied with Employers State Law Alert, simply let us know within 90 days, and we will issue you a complete refund.